Grandma and Ibi go to town. They take the metro. Ibi looks her eyes out in the city. So many people! Ibi gives a sweet to a beggar. She sees flags and big dolls in shop windows. In the park she sees dogs with jackets. When they are back home, Ibi sums up what she has seen. But what has Grandma seen in the city? Or did she only looked at her grandchild? A multicultural picture book inspired by a summer in New York. Translation rights sold to Spain, Galicia and Korea. Because I love you so much. Crowned with a silver brush! From the jury report; You see well-observed, abstracted figures with almost schematic heads and yet oh so recognizable. 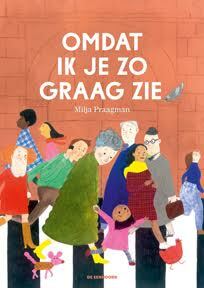 Not only the people in the world are recognizable, also – or indeed – the grandmother and the girl. Their loving relationship is the theme in this beautiful, beautifully drawn and timeless picture book.